Very loud scandal burst out in Russia in June just after first visiting to Moscow about 50 prominent Islamic scholars for International Theological Conference "Islamic Doctrine Against Radicalism". That Conference had to demonstrate a new approach of Russian government to the dialogue with external Islamic world and domestic Muslim community. IslamiCity has devoted to that Conference a special report from Moscow. Suddenly after that showing great promise event a district court of Orenburg city in Russia by its judgment recognized more than 60 Islamic books, including classic Hadith collections and books on Seerah of Prophet Muhammad (peace be upon him) as extremist literature. But Russian Muslims can turn this unthinkable restriction into their real chance for changing their image in Russian society. In the first decade of June the Russian Muslim media has burst with shocking news - district court in Orenburg city had delivered a judgment to recognize 65 Islamic books as extremist literature. The list of these books includes such titl es like Riyadh as-Salihin and 40 Hadiths of Imam an-Nawawi,Prophetic Seerah of Ibn Hisham and al-Mubarakfury, Fortress of the Muslim by al-Qahtani, Criterion of Action of Imam al-Ghazali, History of Prophets from Adam to Muhammad. Moreover this list includes books of Turkish thinkers Said Nursi, Fethullah Gulen, Osman Nuri Topbash, Omer Chelika, Mustapha Ozturk and even modern post-Soviet Muslim authors like "The Path to Faith and Perfection" by most popular Moscow Imam Shamil Alyautdinov and "On the Way to Quran" by Azerbaijan translator of Quran Elmir Kuliev. By Russian legislation such judgments delivered by regional and district courts should be accepted by Ministry of Justice because of obligatory and binding nature of such judicial decisions for Executive branch of power. That is why Russian Ministry of Justice during several years had to widen the official Federal list of books and papers recognized by different Russian courts as extremist materials. In this list can be found not only articles and brochures of Nortnen Caucasian insurgents about Jihad, but books and papers of Jamaat Tabligh, Hizb ut-Tahrir and even Turkish Nur Jamaat. Moreover this list includes Kitab at-Tawheed by at-Tamimi, Aqida by Muhammad Zinu, True Islamic Personality of the Muslim by Muhammad Ali al-Hashimi, Pictures From Lives of Disciples of Messenger of Allah by Abdurrahman Raafat al-Bashi and even Last Will and Testament of Imam Khomeini. After the news about judgment of Orenburg court on Islamic books has reached Muslim community it bursts up with fury. All Russian official centralized Spiritual boards - Russian Council of Muftis, Central Spiritual Board of Muslims, Coordination Center of Muslims of Nortnen Caucasus, Russian Association of Islamic Consent, including regional Spiritual boards within them - condemned this judicial decision. "We consider the prohibition of religious literature as an attempt at the revival of total ideological control, - declared the Russian Council of Muftis in its statement on the judgment of Orenburg court, - Such practice is unacceptable in a democratic society...and is an alarm signal for Russian citizens". 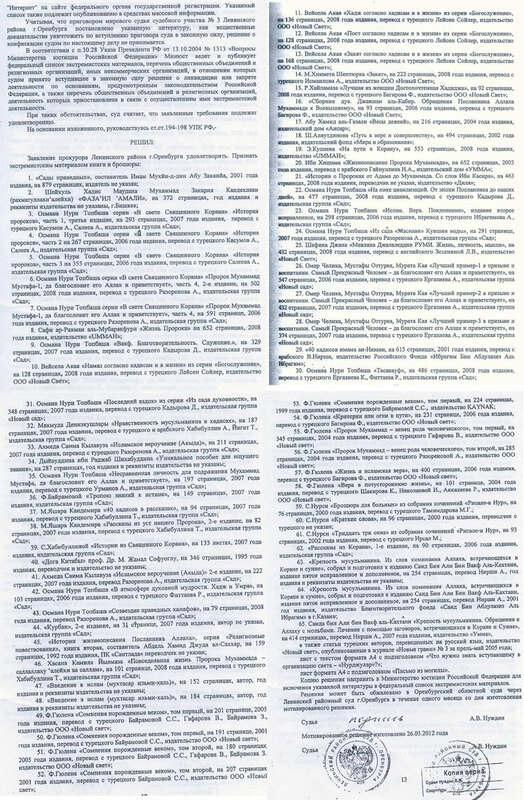 "We are most profoundly outraged by the decision to ban dozens of authoritative Islamic books, - stated Spiritual Board of Dagestani Muslims, - By its essence, the prohibition of these books is prohibition of the Islam in Russia, because they include the interpretation of the Holy Quran, the biography and teachings of the blessed Prophet Muhammad (let Allah bless and welcome him), the training in the Islamic prayer, fasting, zakat and pilgrimage, which form the very basis of Islam and make the integral and mandatory practice of every Muslim". Different communities and groups of Muslims also made very critical statements and declarations on this issue. The Union of Russian Muslim Youth sent a special appeal to the President of Russia Vladimir Putin with their protest against the court decision on Islamic books and with request to annul this injustice judgment. The official reply from Presidential Administration reached the Youth Union in a day. This fact is evidence to that the Administration very attentively and intently watches the situation with books banning. But from another hand this official reply states that according separation of Executive and Judicial power in Russia Administration can not interfere this case and recommends Muslims to appeal against this judgment at higher court. The main reason of recognizing of such quantity of classic Islamic books as extremist literature from one side is very low professional competence of Russian law enforcement agencies and experts on Islamic culture. Police during its raids on different really extremist groups always confiscates a big number of religious books. As a rule among confiscated materials there are really extremist books but there are classic Islamic works like Seerah, collections of Hadiths or dua'a. After each of such raid a prosecutor organizes religious expertise of confiscated books all together. And this is why such expertise organized by authorities more often than not recognizes all confiscated books as extremist literature. As for Russian courts they after receiving such rash and thoughtless decisions of experts try in a hurry to ban confiscated literature all together without any differentiation between really extremist works and classic Islamic books. But from another side there is an opinion that Russian law enforcement agencies intentionally widen the list of extremist and banned literature. But this policy of Russian law enforcement agencies and regional courts radically contradicts the strategy of Russian Federal government which sequentially and step by step works on developing trusted relations with Islamic world and domestic Muslim community. It is demonstrative enough that till now books banned by court decision were not included to the Federal list of extremist materials on the website of Russian Ministry of Justice. This miscoordination in governmental activity toward Muslim community between Federal and regional levels of power in Russia has been noticed by big number of Russian and foreign experts. And this problem of inconsistency of governmental policy on domestic Islamic field is one the main reasons of raising distrust of Muslim community to Russian bureaucracy. As experts report in all previous years, the most severe persecution in Russia was directed toward particular religious groups. In the same time certain categories of political and civic activists also became targets for "inappropriate anti-extremism". During last decades International and Russian human rights organizations have been criticizing approach of Russian bureaucracy and judicial system to examining religious books through the prism of extremism. Just a couple of examples. As Human Rights First reports since June 2011, the state prosecutor's office in Tomsk city initiated an epic legal battle to ban a translation of the Hindu "Bhagavad Gita As It Is" as extremist material. The judge dismissed the case and then denied the appeal in March 2012, demonstrating to the wider world that the legal system is capable of preventing egregious misuse of anti-extremism. In October 2011, Artur Surin, the Deputy Minister of Education of Bashkortostan - a half-Muslim region of Russia - took initiative in "combating extremism" and warned local educational institutions about the dangers of foreign religious organizations of "destructive persuasion," listing one hundred such extremist groups, including Evangelical Christians, Pentecostals, the Jehovah's Witnesses, and Scientologists. Than human rights groups, the Advisory Council of Protestant Leaders of Russia, and the Federal Ombudsman's Office quickly flagged the case to the government, and the Prosecutor General's Office issued an official condemnation, noting that Mr. Surin's letter mentioned religious groups that are "officially registered and act according to the Russian law." For intellectual leaders of Russian Muslim community it is clear enough that the problem of widening list of extremist literature at the expense of classic Islamic works can not be solved only by angry declarations and statements. During this scandal were announced several ideas which might be more effective than declaring one's disagreement with court's judgment. The first decision was offered by lawyer Rustem Valiullin when he has filed an appeal to the higher court against the judgment of Orenburg district court on Islamic books. The second decision was offered by Russian Scientific and Educational Center "al-Wasatiya". In the official statement on this case "al-Wasatiya" Center declared that it is ready to republished banned Hadith collections and books on Seerah of Prophet Muhammad (peace be upon him). Against this background Russian Public Chamber - some kind of regular Forum of pro-governmental NGO leaders and activists - suddenly offered more effective initiative. On one of their meetings in this June the members of Public Chamber jointly with representatives of Russian traditional confessions - Christianity, Islam, Judaism and Buddhism - called for changing anti-extremist legislation. They required from power the acceptance of special law which will be able to protect the Holy Scriptures from accusation in extremism. This initiative may lead to the changing or even abolition of Federal list of extremist materials. Moreover, "Religious organizations which refer the banned literature should appeal Constitutional Court of Russian Federation", - is convinced Elena Lukyanova, the Head of Institution for monitoring effectiveness of enforcement within Public Chamber. Thus Russian Muslims get a chance to initiate in Russia a serious legal reform in the field of anti-extremist legislation. But the problem is that within Russian Muslim community there is a big lack of professional lawyers, advocates and public activists which understand the logic of Russian judicial system's functioning and have required skills and experience of interaction with official bodies. That is why this initiative most likely can not be realized by Russian Muslim community single-handed. But the problem can be solved by collaboration of Russian Muslims with other minority religious communities, like Protestants or Judaists. And such collaboration can give to Russian Muslims the second chance - to demonstrate to all Russian society their peaceful nature and readiness for interaction with different religious and social groups for protecting their freedoms and rights. Exactly in accordance with Prophetic Hadiths and Seerah banned by Russian court as extremist literature. - Photocopy of decision of district court of Orenburg city on recognizing 65 Islamic books as extremist literature. 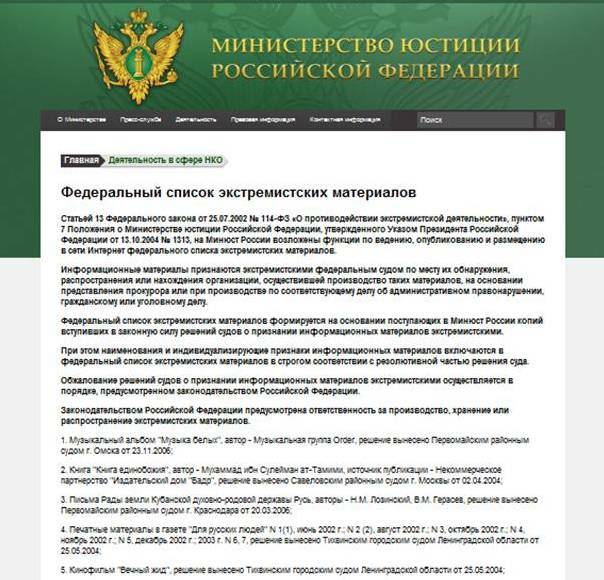 - Screenshot from website of Russian Ministry of Justice. Page with Federal list of extremist materials. Relax. Next time "Communist Manifesto" and "Das Kapital" will be declared as extremist and to be banned. Not a far-fetched prediction. May be, Muslims should bring such a lawsuit in Russian courts. Frankly, Jamaat Tabligh, Hizb ut-Tahrir (whose publications are to be banned in Russia) are considered to be extremist organizations in the West, though not banned (yet) because of the democratic nature of the West. Russia has no such qualms. May be, they will go 100% internet, which is hard to ban and keep banned for too long.